Kat, the new girl in town, starts to get close to a group of high school-aged drug dealers but has a secret that will pose problems for them and their ruthless supplier. We see so many dramatic crime thrillers involving drugs in low-income communities that we always hope one of them might be able to distinguish itself from the pack and make a real impact. 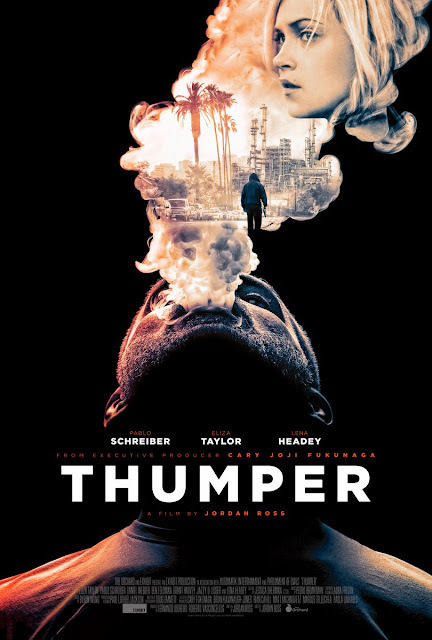 Jordan Ross's "Thumper" is yet another film that doesn't do a whole lot to differentiate itself from the hundreds of other movies just like it. It stars Eliza Taylor as Kat Carter, the troubled new girl in school. After she lets a delinquent kid named Beaver, played by Daniel Webber, cheat off her test in class, he starts to ask her to hang out with him and his drug dealer friends. Kat starts to get close to Beaver and works her way into the circle of trust with almost every crew member with the exception of their supplier and cooker Wyatt Rivers, played by Pablo Schreiber. Wyatt is a former soldier and is extremely paranoid. He doesn't trust anyone, especially this random new girl who seems to have weaseled herself into their clique very rapidly and from out of nowhere. Wyatt has a good reason to be worried since Kat has a dangerous secret (which is revealed pretty early on in the film) that could pose a threat to him and everyone in his operation. Al of the characters in this movie has problems and family drama as they all come from fractured homes. Of course, pushing drugs is what they do to get by with the promise of a better life someday. It is really hard to talk about "Thumper" without mentioning one minor spoiler: Kat's big secret. It is mentioned fairly early in the film so *****SPOILER ALERT***** just in case you don't want to find out.................. she's an undercover cop. As a cop, Kat is attempting to get close to these dealers in an effort to infiltrate their unit and bring them all down, Wyatt in particular. This is a very basic undercover crime thriller about a police officer who gets way too attached to their intended mark. One may call this a rudimentary "Donnie Brasco" with much less pomp and circumstance. The narrative isn't as strong as it could be and the story is not very tight or clean in terms of its direction and what it is trying to accomplish. Kat is supposed to be a very seasoned undercover officer, but she is super sloppy and careless in her work. In fact, we're surprised she didn't get blown up half a dozen times. While the characters and story aren't exactly well written, luckily, some of the performances are solid, so it's not a complete waste. We really like Pablo Schreiber as drug cooker and supplier Wyatt Rivers. Schreiber is extremely intimidating at times, towering over those he's attempting to control in size, stature, and prowess. Writer/director Jordan Ross attempts to make all of the characters, even the pushers, sympathetic. Ross tries to excuse this behavior since the characters come from abusive and/or broken homes, they have siblings with mental disabilities, have parents that are not around, etc. Ross is trying to show that they are victims of the system and are being forced into this lifestyle in order to survive. These elements allow for a tension-filled moment or a bout of excitement every so often, and though these times are entertaining, they are also a little bit cliche and don't provide anything new to a movie like this. In the end, though it does have its moments, "Thumper" certainly would've benefitted from a more cohesive narrative, a more flashy story, and more genre newness. Pablo Schreiber is really the only standout performance, but he can't carry it all on his own.